Everton failed to improve on a poor run of results as they slumped to a 3-1 loss at the hands of Wolves and, while nobody kitted in blue covered themselves in glory, there was one man in particular who is surely disappointed by what he offered to the game, especially considering the influence he usually has on proceedings. Nuno Espirito Santo’s are tough to beat – they are organised in defence, dangerous on the break and their consistency has seen them rise to seventh in the standings – however, considering their expenditure in recent years, the Toffees should really be giving them a game and, had their star man been at the races, they may have. Richarlison followed Marco Silva to Everton from Watford in the summer as the Portuguese brought his 2017 signing to Goodison Park and the forward got off to a flying start, netting twice against none other than Wolves on the opening day as the Toffees held the newly-promoted side to a 2-2 draw. The absence of a goalscoring striker has often seen the Brazilian deployed up front – he is naturally a winger – and he usually puts in a decent shift, as five goals from 12 appearances at centre-stage will tell you. The 21-year-old was surely hoping he would be able to have the kind of impact he had at Molineux as Everton hosted the return fixture on Saturday, but it wasn’t to be. Richardson’s silky, South-American close control was absent as he uncharacteristically struggled to get a foot on the ball and drive at the defence – the number 30 took 6 unsuccessful touches, as Wolves hunted him down effectively and bullied him out of the game. Blessed with pace, the forward can usually be relied upon to get in behind the opposition and cause problems with his trickery, but he completed zero dribbles and thus gave the Wolves back four little to worry about all game. Being deployed as a central striker, the Everton ace showed his instinct as a wide man to drift out to the wing and whip in a cross – he did this twice, but neither were accurate – and, while his new role offers him more opportunities to have a pop at goal, he took zero shots and so failed to trouble Rui Patricio. Offering little to his team on the front foot, the attacker did still work his socks off as he chased down every ball and made four tackles – the most in his side. The pressure is rising on Silva to start delivering results more consistently – the Merseyside outfit sit ninth in the table but have lost five of their last eight in all competitions. 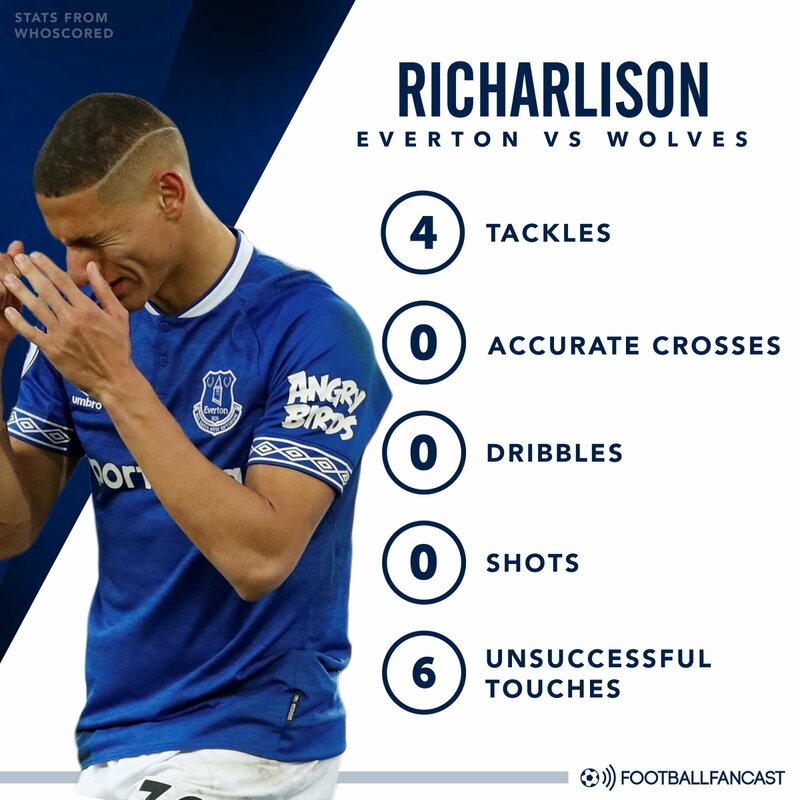 There is no doubt that the winger is far more effective on, well, the wing, and Director of Football Marcel Brands’ failure to bring in a competent striker to relieve him of his centre-forward duties is really starting to cost both Richarlison and Silva.